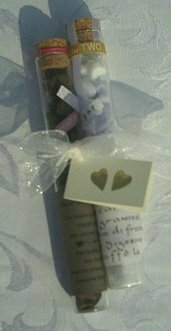 Asian wedding favors includes forturne cookie place card holders, fortune cookie soaps, personalized chopsticks and so much more! Large Asian Spoons made of fine white porcelain. Perfect for a sweet treat or interesting accent. Perfect for Asian wedding favors. Price is per set of 12 Asian spoons favor holders. Asian Votive Holders These Asian votive holders are perfect for your Asian themed event. These glass holders feature love, peace, and fortune symbols. These make excellent Asian wedding favors. Votives are not included. Price is per holder. Must order in increments of 12. 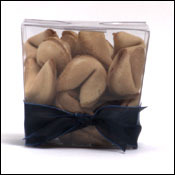 Bulk Fortune Cookies Share good fortune with your wedding guests and serve up these wedding-theme fortune cookie favors that pair perfectly with our Chinese Take-Out Favor Boxes (sold separately). Fortunes include sayings like "Heaven will be no heaven to me if I do not meet my wife there. -Andrew Jackson" and "In a successful marriage you fall in love many times...with the same person." Cookies shelf life: approximately 3 months. Pack of 100. Price is per set of 100. Minimum is 4 sets. 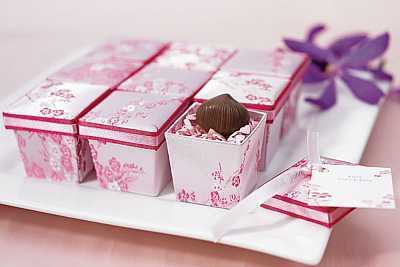 Chinese Frosted Take Out Boxes Add a playful touch of color to your Asian-theme shower or Asian wedding with these plastic Chinese frosted take-out boxes favor holders. 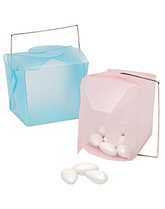 Each translucent pastel box has a wire handle and holds a small favor or a generous handful of Jordan Almonds. Add ribbon and a favor tag for a personalized touch. Choose Blue, Pink, White, Lavender, or Green. 2 3/4" w x 2 1/2" h x 2" deep. Set of 6. Jordan almonds, ribbon, and favor tags sold separately. Great for Asian wedding favors. 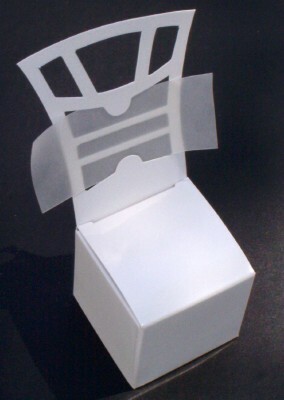 These Chinese takeout boxes are great to add candy or fortune cookies or fortune cookie soaps. You can even add confetti bubble bath or the rose petal soaps. Small 2 1/6 x 1 7/8 x 2 1/2 Medium 2 7/8 x 2 3/8 x 3 1/4 Large 3 3/4 x 3 1/4 x 4 3/8 You can choose clear or frosted. The take out boxes are packed flat and come with a gold handle which must be assembled. You can not use it and add a colored ribbon to match your theme. The prices are listed in the size option drop down box. Chinese Tapestry Candle Favor As rich in color, mystery and tradition as the Orient itself, the �Chinese Tapestry� Votive Candle turns custom inside out with the truly dramatic beauty of this favor found in its exquisite presentation. 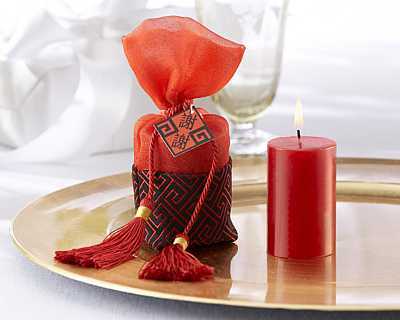 Surrounding a 2 �� h x 2� w, deep-red candle is an elaborately designed, red-and-black Chinese tapestry pouch, accented with vibrant red organza tied with a matching �double-happiness� tag and red braid ending in two large, gold-thread-trimmed tassels. The favor, one of the most visually stunning ever designed, stands 5� high. Price is per Chinese Candle Favor. Minimum order is 12. Double Happiness Asian Favor Box To honor timeless tradition and offer heartfelt wishes for double happiness, we present �Double Happiness� Favor Boxes�gracious in spirit and gorgeous in design. The rich, red-and-gold, tapestry-like design of the box is beautifully accented by a metallic-gold bow and the Asian �double happiness� symbol. Each 3� x 2� x 2� favor box in the set of 24 is waiting to be filled with a scrumptious, sweet treat or a meaningful token of your appreciation. Your guests will be touched by your celebration of a proud heritage. Price is per set of 24 Asian Favor Boxes. Fortune Cookie Placecard Holders We predict...these fortune cookie place card holders modeled after a favorite Chinese take-out treat will send guests straight to their seats! With a substantial feel and black felt bottom, this silver-plated fortune cookie makes a unique paperweight or photo holder postwedding. Guests will love 'em! Place cards not included. 1 1/4" w x 1 1/4" l x 1" h. Must order in increments of 12. Price is per set of 12 placecard holders. Heart Shaped Tea - Heart Shaped Sugar Favor Our heart shaped drop tea and heart shaped sugar are paired together with a hang tag. The tag reads "Love is Brewing" with your names and wedding date. Put your personalization information in the comment field below. They are packaged in a cute glass tube that measures 6"L x 3/4" D. This drop tea and sugar is imported. To make, just "drop" 4 or 5 tea tablets into a cup of boiling water. Use the heart shaped sugar to sweeten, if desired. There are approximately 45 drop tea tablets and heart sugar cubes in a cylinder. Heart Shaped Tea Infuser Heart shaped tea infusers! What a way to romance the leaves! Your guests will love these stainless steel infusers with a spring-action handle. 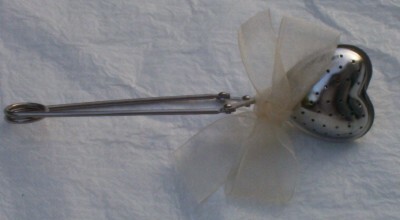 Add a cute little bow for a gift that your tea party guests will soon not to forget. Minimum order is 3 packages. Price is per package. 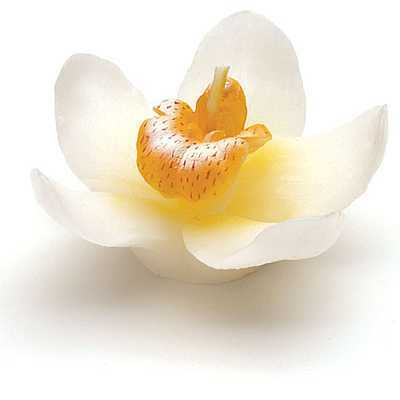 These miniature white orchid candles make great novelty favor stuffers or fun decorative add-ons. 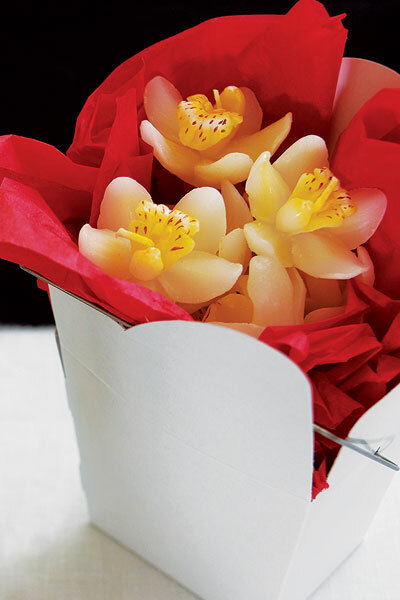 All candles are packaged in box with raffia. 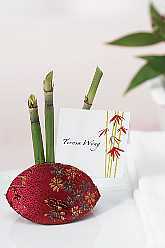 Great for Asian themed wedding favors. 6" x 3" x 1 3/4" H, Pkg. ct. 2. Price is per package of 2. Must order in increments of 6 packages. 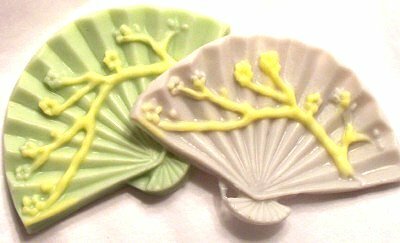 This cute oriental fan soap will be a big hit as your Asian wedding favors or hotel guests gifts. The oriental fan soaps are packaged in a cello bag and tied with a ribbon. ~3"W x 2"L. Price is per soap. 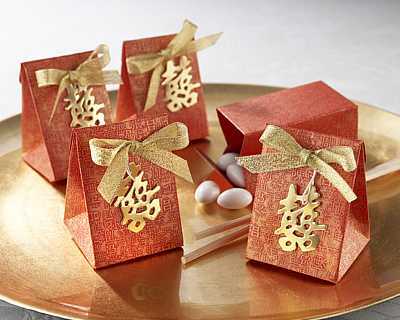 Personalized Chinese Take-Out Boxes For an Asian-inspired wedding, or even just for the fun of it, why not place your favors in these mini Chinese Take-Out Favor Boxes. Made of white cardboard with metal handles (just like the full-size ones! ), the boxes have lots of room inside for holding candy or fortune cookies (not included). 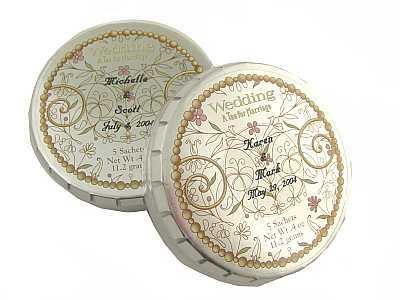 The boxes can be personalized with a sticker that displays the couple's names and wedding date (two lines of text). Choose from 5 different designs (shown here with "Love"), and Gold, Silver, or Black ink. 3 1/4" x 2 1/2" x 2 1/2" high. Pack of 10. Hold your future in your own hands! Personalized wedding fortune cookies, who would have thought? These personalized fortune cookies come in different gourmet flavors. They are individually wrapped. 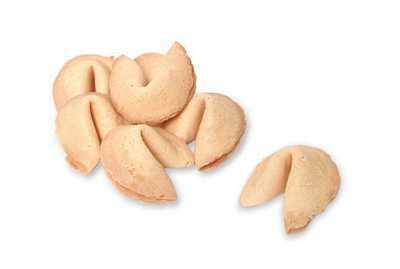 You can choose up to 5 fortunes Minimum order is 200 cookies. ENTER YOUR PERSONALIZATION INFORMATION IN THE COMMENTS SECTION BELOW. 9 working days lead time after typeset approval. Rush ($45) for 5 working days and Super Rush ($100) for 48 hours. 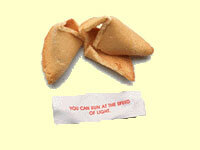 If you would like to have your fortunes seperated, there is a fee of $20. Otherwise they will be mixed. Sandalwood Fans These sandalwood fans are a must have for your garden event in the spring and summer. The 9" fan opens to a 15" width. There is a tassel on the fan that can be easily removed so that you can color coordinated your theme. They release a light natural sandalwood scent when waved. Must order in increments of 10. Price is per fan. 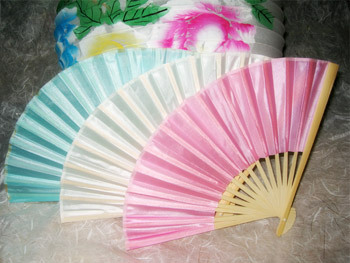 These Silk Fans are great as party favors for Summer weddings or outdoor parties. They're made out of natural bamboo covered with Silk on top. They come in 4 diffenrent colors white, Pink, Burgundy and Blue to easily match your theme color. Fans measure 9" long. Price is per silk fan. 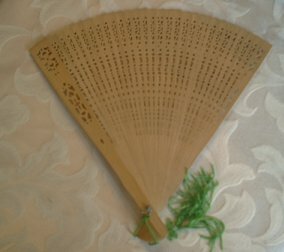 Minimum order is 10 silk fans. 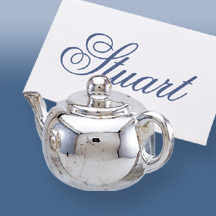 Teapot Placecard Holders These teapot placecard holders are SO appropriate for any tea party. There are 6 per set. They are 1 1/2" wide by 3/4" tall. They are nicely weighted and have a felt bottom. 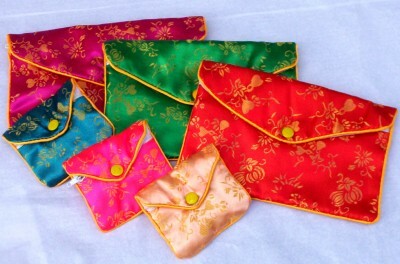 Asian inspired satin coin purse and travel bags are great Asian themed favors. They are a great way to send invitations by using them as an envelope. You can put little trinkets inside. They are very economical and really cute. Price is per assorted set of 6. 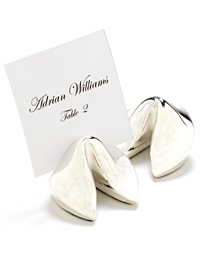 Wedding themed fortune cookies are great for showers, engagement parties and wedding favors. 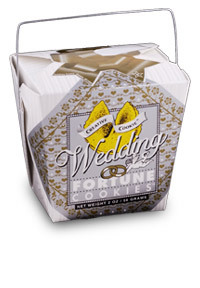 Each wedding fortune cookie pail contains 9 wedding themed fortune cookies. Price is per pail. These can be personalized with a really cute 1 dimensional "bow". Must order a minimum of 24, and increments of 12 after that, to have them personalized. If you want them personalized add your personalization in the comment field below. Minimum order is 12. Must order in increments of 12. It isn't just a wedding. It's the last time any of us will fit into a size 5! Give a girl enough rope and she'll ring the wedding bell. It takes a smart husband to have the last word - and not use it.